Due to a series of intelligent optimizations that make Pivot3’s architecture inherently unique, end users across all workloads and use cases benefit from higher levels of availability and fault tolerance, which prevents against data loss and ensures business continuity. While most other hyperconverged vendors rely on resource-intensive, hardware-based replication, Pivot3 uses erasure coding to distribute data across the system ensuring maximum performance and resiliency are always maintained. This aggregated resource distribution for virtual storage and compute provides increased performance and efficiency for all virtual machines, industry-leading usable storage capacity, and scales out linearly with each added node. All of this is easily managed through a single user interface, seamless VMware integration, and comes pre-configured with straightforward management capabilities that are self-optimizing, self-monitoring and self-healing. Performance – 2-3X the performance of replication-based 'local' HCI platforms with extremely low compute overhead. Resiliency – Extreme availability and high fault tolerance so you never lose data in the event of a drive or node failure. Efficiency – The most efficient data protection platform in the industry with maximum usable storage capacity for significant cost savings. Simplicity – Effortless, single-source-of-truth management capabilities that are self-optimizing, self-monitoring, and self-healing. 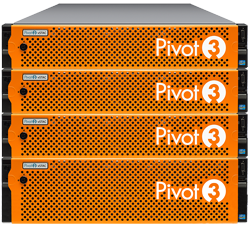 Pivot3 provides a wide range of hyperconverged solutions depending on customer need.Our innovation is in our software platform, which is designed to run on a variety of hardware options.We package our solutions either as preconfigured appliances or as software-only that can be installed on the customer’s hardware platform of choice. Maximum resource utilization: HCI nodes deliver maximum resource utilization and high availability that performs via unified compute and storage within our patented vSTAC operating environment with flexible deployment options. Better ROI with vSTAC OS: Pivot3’s lean operating environment consumes less than 8% of system resources, leaving more available for VMs and applications. And highly-efficient capacity utilization improves as it scales, up to 94% in certain cases. Support the full spectrum of data center needs: With the simplicity and economics of HCI and the predictable performance of flash and Dynamic QoS, businesses can now confidently support a full spectrum of applications, including mission-critical, with low-latency shared flash acceleration and granular, automated performance management. Pivot3 All-Flash Enterprise HCI appliances provide enterprise-class processing performance, higher availability, and lower total cost of ownership so enterprises can realize long-term cost savings while ensuring seamless scalability as operational needs grow. The enterprise-class HCI Hybrid model pools all resources when stacked in an array as our patented software defines IT operations by dynamically aggregating, load-balancing and optimizing shared storage, compute, and network resources to deliver optimal performance. Edge Office addresses helps Small business (SMB) and remote or branch offices (ROBO) of larger organizations by collapsing compute, storage, networking and virtualization into a simple and affordable HCI solution that can be managed by a single IT generalist. Edge Office affords the SMB and ROBO customers the same benefits that our enterprise customers benefit from. Pivot3 vSTAC SLX provides low-latency shared flash acceleration and granular, automated performance management so businesses can confidently support a full spectrum of applications, including mission-critical. Combining the simplicity and economics of hyperconverged with QoS-managed storage, vSTAC SLX handles the full spectrum of data center requirements. 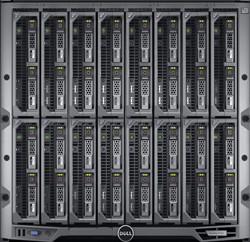 Pivot3 is the only hyper-converged infrastructure provider that makes HCI economically feasible on high-density blades, blending the convergence of storage and compute resources with high computational density to deliver the most efficient platform for consolidating the data centers of medium to large enterprises. Cisco UCS and UCS Mini, powered by Pivot3, delivers a total virtualized IT infrastructure solution that unlocks enterprise capabilities in a small, efficient form factor and removes that cost and complexity of maintaining an external SAN and consequently reduces the costs associated with rack space, power, cooling, and administrative resources while significantly reducing your data center footprint. Pivot3 is uniquely suited to getting the most out of a modular server environment by combining the high IOPS performance of SSDs with maximum storage efficiency of vSTAC OS for a dense and powerful enterprise IT platform and a completely new approach to data center infrastructure. NexGenWorks.com is a division of Virtual Graffiti Inc, an authorized Pivot3 reseller.